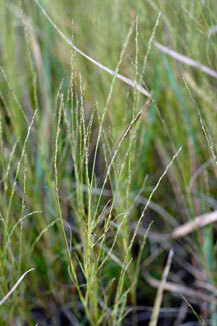 Muhlenbergia cuspidata (Torr. ) Rydb. Culms: Slender, stiffly erect, solid, flattened, minutely hairy below nodes, often thickened and bulblike at base; rhizomes absent. Forms tufts or small clumps. Blades: Erect or ascending, flat, folded longitudinally or with margins loosely involute, 2 to 9 inches long, to .12 inch wide. Sheaths: Keeled, glabrous or rough. Ligules: Minute, .01 to .02 inch, membranous. Inflorescences: Panicle, very slender, spike-like, 2 to 5 inches tall, base not enclosed by sheath; branches short, appressed to rachis. Spikelets: Short-stalked, 1-flowered, .1 to .16 inch; glumes nearly equal, 1-nerved, lanceolate-subulate, .06 to .12 inch, overlapping at base, tips sharply pointed , awnless or with minute awn; lemma lanceolate to narrowly ovate, .1 to .16 inch, 3-nerved, acuminate, awnless, minutely pubescent on back, otherwise glabrous. Habitat: Prairies, open hillsides, stony slopes; dry or gravelly soils. Uses: The Navajo used the stems to make hit brushes and brooms.